Do you know your credit card APR? 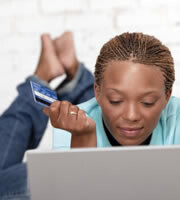 Do you know your interest rates on each of your credit cards? According to a report by FINRA Investor Education Foundation, 36 percent of cardholders don't know the rate on the card they use most often, and that can be a costly mistake. The national average Annual Percentage Rate (APR) for a credit card is 14.78 percent, but rates can run much higher. A recent study found that store cards in particular charge sky-high rates. The Radio Shack credit card, for example, charges one of the highest interest rates at 28.99 percent. Staples and Best Buy also charge high interest rates -- 27.99 percent on average. Let's say you have a credit card with a balance of $4,500, and you're paying 28 percent a year to borrow that money, or $1,260. That $1,260 a year could be working for you in a high-interest checking account instead of going to the credit card company. If you paid that amount into a high-yield checking account every year for 10 years at 4 percent, you'd have more than $15,000. Your interest rate matters, especially if you're working to pay off debt. First, make an appointment with yourself. Block out some time on your calendar. This sort of thing usually languishes on to-do lists, and meanwhile you continue to shell out money for interest on your balances. Schedule a money day, or even just an afternoon, and make it an appointment on your calendar. Look up the APR on every credit card you have, even the ones you might not use very often. When it comes to APRs, ignorance is not bliss. Call each credit card company to negotiate for lower APRs. Tell the representative you'd like a lower APR. If they refuse, cite how long you've been a customer, and how you'd like to stay with them versus moving your balance to a low-interest card. It doesn't always work, but it's worth your time to try. After calling each company, take a good look at your credit lines and interest rates and make a game plan to pay off credit card debt. If you have store cards with outrageous rates, cut them up. You can leave the credit line open to help out your credit score, but pay off the balance as soon as possible and never use the card again. Get control of your debt by either paying off lowest balances first (for a psychological boost) or highest interest balances (for maximum savings). Whichever you choose, the most important thing is to have a plan and stick with it. A few hours to get organized and make the calls is a small time investment for the financial rewards that could equal a few years' savings. 0 Responses to "Do you know your credit card APR?"